As reported by both Russian and international news services, on December 26, 1999 the first service in 70 years was held in the Church of the Nativity in the small town of Vereya, some 100km southwest of Moscow. On that day, residents buried in a crypt in the Church, the remains of General Lieutenant Ivan Semyonovich Dorokhov. This service in fact returned General Dorokhov's remains to the crypt in which townspeople first buried him in 1816. This small community, even today of only some 5,000 residents, honors the General because he commanded the Russian forces that liberated them from the French in 1812. Ivan Semyonovich was born in Tula, to the south of Moscow and even in 1762 an armaments center. In 1787, Dorokhov enrolled in a cadet corps and served with it during the 1787-1791 Russo-Turkish War. In 1795, he selected the cavalry as his branch of service. By May 20, 1801 he was Colonel and commander of the Sumskiy Hussar Regiment. On August 4, 1803 he was promoted to General Major and became "shef" of the Izyumskiy Hussar Regiment, later leading his regiment during the 1806-1807 campaigns against France. Dorokhov remained "shef de regiment" until September 1, 1814. 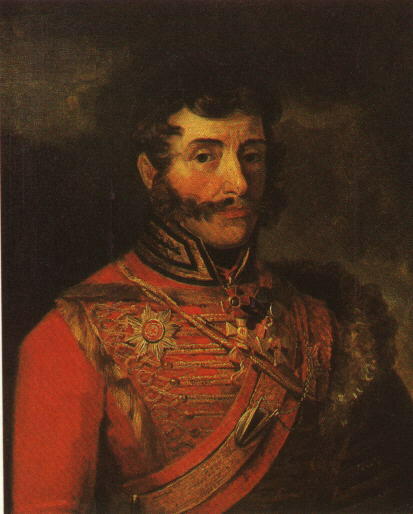 As the 1812 campaign began, General Major Dorokhov commanded the 11th Cavalry Brigade. At Borodino, Dorokhov commanded a division made up of his now 3rd Brigade and the 1st Brigade of the Third Cavalry Corps. This division began the day in a reserve position behind and to the north of the ruins of the village of Semyonovskiy. By shortly after 9 am, the French were preparing their fourth attack on the three fleches held by Prince Bagration's army. As this attack actually secured the center fleche and threatened a breakthrough despite repeated Russian counterattacks, Bagration ordered Dorokhov's division to attack in support of the counterattack of the Russian 3rd Infantry Division. Ivan Semyonovich now had 8 dragoon squadrons and 16 hussar squadrons - the Sumskiy Hussars, the Mariupol'skiy Hussars, the Kurlyandskiy Dragoons, and the Orenburgskiy Dragoons. As Dorokhov led his division around the north flank of the centermost fleche, his horse was killed and a crowd of enemy cavalry swept over him. He was quickly rescued, however, by some of his troops and a regimental trumpeter gave the General his own horse. Without a word, Dorokhov took the trumpeter by the hand and then mounted. He sped to the head of his hussars who had thought that he had been killed. Dorokhov's attack caught the French in their flank as they faced the attacking Russian infantry and the French were forced back on their own guns. His division remained in support of the Russian left wing for the remainder of the day, even as they were driven back from the fleches and across the ravine to the ruined village of Semyonovska. After the battle, the Marshal Kutuzov accepted Barclay de Tolly's recommendation that General Dorokhov be sent with a mixed force of cossacks, hussars, yegers, and horse artillery to the northwestward of Moscow to attack the French supply lines and wagon trains. 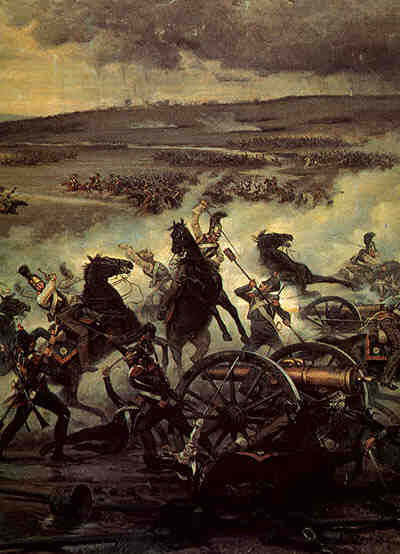 On September 24, in this process, Dorokhov's force overwhelmed some 150 French Imperial Guard Dragoons, provoking great consternation among Napoleon's staff. On September 29, General Dorokhov led five infantry battalions, four hussar squadrons, three cossack regiments, and eight horse artillery guns - some 5,000 men - against the French garrison of Vereya. Once a fortified town, Vereya ceased being considered a fortress in 1782, though it reportedly still had some of the old earthen embankment walls along the River Protva and wooden fortifications had stood there as recently as the end of the 17th Century. But with the help from the town's inhabitants, the French were overwhelmed and an entire Westphalian battalion reportedly captured. Subsequently, Dorokhov's command was also the first to spot the French withdrawal from Moscow and so inform Kutuzov. In October, Prince Eugene's IVth Corps was marching from Moscow towards Maloyaroslavets. Under orders not to take risks and to proceed with caution, Eugene's lead 13th Division stopped at the Luzha River late on October 23. Confronted with a single bridge which had been wrecked by retiring cossacks, General Delzon sent only two battalions across into the town, located on the higher southern bank, and encamped the remaining forces on open ground on the river's northern bank. At 4 am the next morning, four regiments of Russian yegers attacked and pushed the two sleepy French battalions back to the very edge of town near the bridge. Russian guns pushed back an immediate attempt by Delzon to reinforce his two battalions and the long hard seesaw battle began. Control of the town passed back and forth at least seven times, as pockets of soldiers holed up in buildings made it difficult for either side to hold the town around them. Both sides fed further troops into the battle which ended only at 11 pm when the Russians finally could do no more and gave up the now-burning town. During the day's fighting, Dorokhov was seriously wounded, although the exact details remain unclear and he never served actively again. On October 31, 1812 he was promoted to General Lieutenant for his service at Borodino and afterwards. He died in 1815 as a result of his wounds. His portrait is included in the 1812 Gallery of the Winter Palace in St Petersburg, now part of the collection of the Hermitage Museum. Ivan Semyonovich Dorokhov is also commemorated by a statue and a victory monument near the Church of the Nativity in Vereya, both dedicated during the 1912 anniversary of the Patriotic War - with members of the Imperial family in attendance. However, after the 1917 Revolution, Dorokhov's remains were removed from their resting place in the Church of the Nativity and tossed over a cliff. Local residents still loyal to his memory reportedly gathered the remains and secretly interred them in a grave only rediscovered in September, 1999. This opened the way for the re-interment of the remains in the church on December 26, 1999. Cate, Curtis. The War of the Two Emperors: The Duel between Napoleon and Alexander Russia 1812 New York : Random House; 1985. Nafziger, George F. Napoleon's Invasion of Russia, Presidio Press; 1998. Podmazo, Aleksandr. Shefy I Komandiry Regulyarnikh Polkov Russkoy Armiy (1796-1815) Moska : Muzey Panorama "Borodinskaya Bitva"; 1997. "Remains of 1812 War Hero Buried in Cathedral in Moscow Region," Itar-Tass 26 December 1999. Zemtsov,V.N. Bitva Pri Moskve-Reke (Battle on the Moscow River) Moskva : Reitar Izdatelstvo; 1999. Zhilin, P.A. (ed.) Borodino 1812 Izdatels'tvo M'sel, (c) 1987.